Lær om kvikksølvmining og lacemaking i et slott på denne guidede turen. Avreise fra Ljubljana med sjåføren din og legg deg til en kvikksølvgruve i Idrija. Hør historier fra guiden din om kvikksølvgruvehistorien når du kommer ned i gruven. 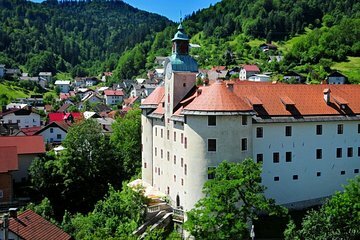 Fortsett til Gewerkenegg Castle og beundre den store samlingen av Idrija blonder. We had a great tour to Idrija with Milan. He told us everything about the region. The visit of the mercury mine was highly interesting and Milan was also able to tell us a lot about the museum in the castle. Our guide, Milan, gave us a wonderful insight into Slovenian history and the Indigra mine and lace making. Going deep into the mine and the way it is set up gave you a real indication of what life was like for the miners. We also got to culinary experience of Indigra pasta ... Delicious. I can highly recommend this half day trip ... You will not be disappointed. A great experience.